Information security shot up from 10th place in 2015 to take the top spot of higher ed IT priorities this year. 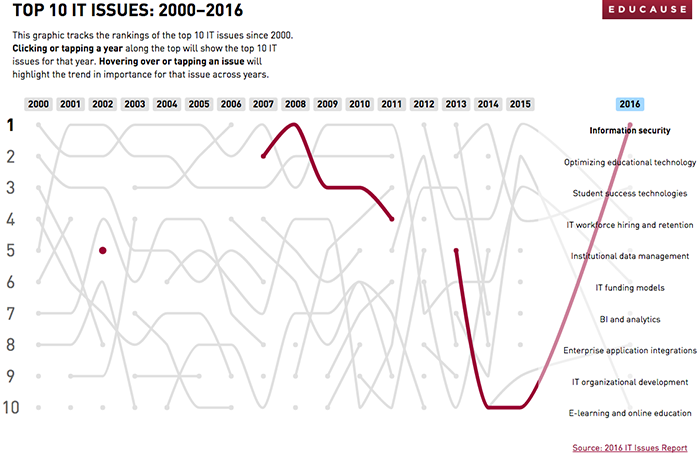 Capping off the release of EDUCAUSE’s Top 10 IT issues of 2016 list, the organization has unveiled a chart that tracks the rankings of the top 10 IT issues from 2000-2016, showing the ebb and flow of IT issues as priorities change across higher education. This year's list includes a few surprise comebacks. For example, information security leapt from the 10th spot in 2015 to the top in 2016. Susan Grajek, vice president of data, research and analytics at EDUCAUSE, tells EdTech that this change shows that higher-education IT leaders are standing up and taking notice of the realities of institutional data breaches. "The pace at which security incidents, breaches and identity theft are happening has continued to escalate," Grajek says. "The common wisdom now is not, 'What do I do if I get breached?' It's, 'How do I prepare for the inevitable breach?'" A wayward issue that regained relevance in EDUCAUSE's 2016's list is "optimizing educational technology,” which was absent in 2015 but ranks second in 2016. On the other side of that trend, online learning dropped from second place last year to 10th this year. Finally, two entirely new issues are on this year's list: "institutional data management" and "IT organizational development," which Grajek linked in a talk with EdTech. Data governance today illustrates the nature of how academia is being organized, Grajek says. "In order to be able to do good and interesting things with analytics, you need good and interesting data. And you need one authoritative source of data as opposed to 80," she says. The distributed nature of data ownership in higher education has limited what analytics can do, Grajek says. Establishing governance structures and agreements with all parties involved about how data will be shared, housed and used within the institution is essential to making progress with analytics. Experience the full, interactive chart on EDUCAUSE's website.